This Campfire Dutch Oven Pineapple Upside Down Cake bakes beautifully over campfire coals and makes a delicious dessert alternative to the usual campfire s’mores. Find more of my cast iron Dutch oven recipes. When my boys were younger, my husband was the Cub Master for their Cub Scout Pack. This was a role he took very seriously and still does as the Scoutmaster for their Boy Scout Troop. Don’t get me wrong, he is an awesome scout leader. He brought a lot of energy and enthusiasm to our pack. Since the hubby never got to be a cub scout or a boy scout, he’s like a little kid again. He has taken several training courses, including Dutch oven cooking. I will never forget one Saturday he ditched me and the kids for a day of “training.” He came back all euphoric and told me about the crafts he made, the activities he participated in, and this amazing dessert he helped cook and eat. I did my best not to laugh in his face and burst his bubble. You see, my husband wasn’t born in the U.S. He came here from Iran when he was 13 years old. He didn’t know that this was an American icon of a dessert! “Fabulous,” I answered sarcastically. I had spent an entire Saturday with bored and nagging children while my husband got to relive his childhood fantasy. Sorry to admit it, but I did burst his bubble. After cooling off for a couple days, we talked about his adventures again. In the coming months, we invested in not one, but two cast-iron Dutch ovens. And we’ve been experimenting with them on and off since. For our neighborhood rafting trip one summer, we made Campfire Chili with a Cornbread Crust. We’ve also made Campfire Eclairs and Baked Apples. So, when my husband told me about our Cub Scout Pack’s Family Camping Trip, I could see the twinkle in his eye as he told me we would make two Dutch Oven Pineapple Upside Down Cakes. This time, I didn’t burst his bubble, but happily agreed to help instead. The Cub Scouts really got into this project. They took turns stirring the batter, placing the pineapple rings in the dutch oven, pulling out the maraschino cherries, and sprinkling the brown sugar and cinnamon on top. An adult was in charge of placing the hot coals under and on top of the Dutch oven. Safety first, of course! The parents attending the camp were happy not to eat s’mores that night! The cakes were a hit, of course, mostly because many were surprised we could bake a cake on a campout. The leftovers were gobbled up during breakfast the next day. Another successful adventure in campfire cooking! And if you want more outdoor cooking inspiration, check out my new cookbook, The Camp & Cabin Cookbook (Countryman Press 2018). I have 100 recipes that are all prepared outdoors and over fire using multiple techniques. 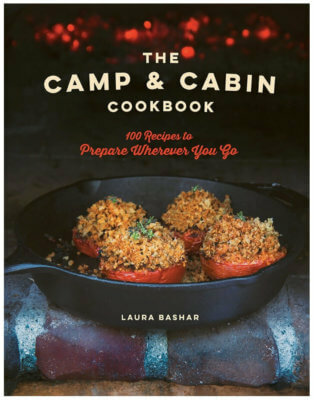 Learn more about my camp cookbook! This Campfire Dutch Oven Pineapple Upside Down Cake bakes beautifully over campfire coals and makes a delicious dessert alternative to the usual campfire s'mores. In a fire ring or other fire-safe container add 20 charcoal briquettes. Light the briquettes and allow to heat up for approximately 20-30 minutes. In a large mixing bowl, whisk together granulated sugar and olive oil until whipped and smooth. Whisk in yogurt, pineapple juice, eggs and vanilla extract. Whisk flour, baking powder and salt into egg mixture until smooth and combined. Line the bottom and sides of your 10-inch cast iron Dutch oven with aluminum foil. This is optional, but makes cleanup much easier. Place one layer, evenly spaced on the bottom of your Dutch oven with 7 pineapple rings. Place a maraschino cherries into the center of each pineapple ring and into any empty spaces on the bottom of your Dutch oven. Sprinkle brown sugar and cinnamon evenly over the pineapple and cherries. In a fire ring or fire safe pan, place 12 of the hot charcoal briquettes. Place Dutch oven over the hot briquettes. Pour cake batter evenly over the pineapple slices and place lid over Dutch oven. Place 8 remaining hot charcoal briquettes evenly on top of the lid of your Dutch oven and bake until cake is done, approximately 30 minutes. Remove Dutch oven from heat and remove lid. Let cake cool for 15-20 minutes. Place a serving plate over Dutch oven, right side down. Very carefully flip the dutch oven over, using oven mitts because the pot is still hot, so that the upside down Dutch oven is resting over the plate. Carefully place the plate on a table and slowly remove dutch oven, making sure the cake remains on the plate. Carefully peel the foil off the cake. You can also bake this cake at home in a cast iron skillet at 350ºF for 30 minutes. I love Pineapple upside down cake! This one looks like it’s right up my alley. Nice addition of the pineapple juice to the cake mix. As much as I love pineapple, I’d never thought to do this. Sounds yummy!